Free Trial - No Credit Card Needed! A feature-rich interface for managers. A streamlined interface for employees. Modify the program yourself, or let us customize it for you. Get up and running quickly by importing your data from another program or spreadsheet. 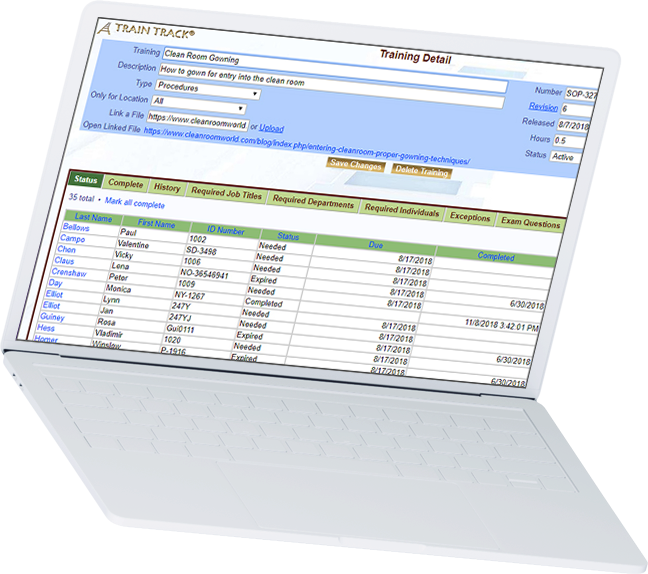 Easily create your training matrix and assign required training based on any type of employee group. Automatic email notices tell employees and supervisors when training is due. Employees can enroll in classes, view documents, take exams, or confirm training completion. Batch-add, import, scan, or let employees record completions with electronic signatures. Over 60 standard reports and custom report filtering gives you the data you need right at your fingertips. Require re-training based on new revisions or expiration periods. Allow users to access different levels of data organized in a meaningful way. We offer three standard packages. Select subscription or one-time purchase. Small organizations are usually fine with the Desktop edition. If you want your employees to take exams using a web browser, you may use the Cloud or Client edition. If you want us to take care of installation and maintenance for you, the Cloud edition is the best choice. If you want to install and maintain the program yourself, select the Client edition. If you are unsure, please contact us and we will help you decide. Yes, Liberty Labs, LLC can customize it for you, or you may customize it yourself with the customizable edition. What are the system requirements for the installed edition? Server: An instance of Microsoft® SQL Server® 2012 or better (you may use your existing version or SQL Server® Express which is free from Microsoft®). The database can be installed on the same server as other applications. A web server configured to support .asp pages (for example, IIS which is included with most versions of Windows®). At least 20MB of disk space. Extremely large databases may require up to 100MB. Client Interface: Standard PC workstation(s) running Windows® 7/8/10. Microsoft® Access® 2010/2013/2016. Workstations may use your existing version of Access® or the run-time version included with the installation files. Web Interface: A standard web browser. The license is for named users. Each person who uses the database will need their own license. It does not matter how many users are accessing the program simultaneously. Employees logging in to view their own status or take exams do not need to have their own license. Administrator, Standard, Limited, Completions-only, and Read-only users do need their own license. "Although [we are] a multi-billion enterprise, with many many systems in place, we find the easiest way to track employee competencies in the organization is via TRAIN TRACK®. The database fits nicely with into other our systems and doesn’t take a huge infrastructure or a long learning curve to extract meaningful data. So far I’ve set up three TRAIN TRACK® Databases and each of the end users are very pleased." "...TRAIN TRACK® is an awesome database. I have worked in training for many years and I haven’t seen any that are this good. Your pricing is remarkable as well!" "...just wanted you to know that [TRAIN TRACK®] has always been Heads & Shoulders above even the Big Boys of the industry." "TRAIN TRACK® is an excellent, robust, capable, flexible, and cost effective system to record and maintain records of company/employee activity as an Access® Data Base." "I love your product and your service and I will continue to brag about TRAIN TRACK® any where I can." "This software has made a world of difference in how North Alabama tracks and reports all training of employees and contract staff. Because of this software, we believe we have set the standard within the State of Alabama mental health system for training documentation. Our most recent licensing and accreditation surveys have been a tremendous success in the areas of employee training and record-keeping thanks, in large part, to TRAIN TRACK®!" Schedule a Live DemoFree Trial - No Credit Card Needed!